Let’s run through the screens that lead up to the action. 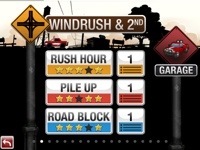 As soon as the player gets past the intro screen, they are presented with a series of road signs that set up the various stages in the game. The only real piece of information here is a prominently displayed number of stars that indicates how much of the stage has been conquered. That and in the upper right, another star count – this time, it’s counting the total number that have been achieved in all of the game. Then after choosing a stage, the player gets to pick an intersection at this stage to play, along with what game mode. 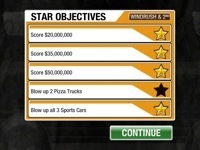 Each game mode offers five different goals to achieve, and thus five stars are available for each. But here’s where my problem lies – there is no way for the player to know what the actual goal is that they are missing. Was this one the “score 80,000” points star, or the “blow up two pizza trucks” one? The only time the player actually gets to see what they need to do is after the game mode has been selected, and from there, backing out isn’t an option anymore. 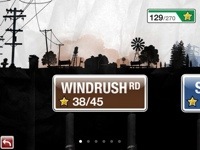 Once a round has been completed, Burnout CRASH! will recap what stars have been earned, but the player doesn’t ever see what ones were missed. So maybe you were just a tiny bit short of earning something? You probably won’t know, unless you happen to remember all of the criteria from the start. Okay, so obviously this isn’t a game breaking detail. But here’s why I think it’s a relatively big deal – Burnout CRASH! encourages gamers to – much like Pokemon – collect ’em all (stars that is). So then, gamers are probably at some point going to go through their list of intersections and try and pick up stars they missed along the way. That’s where it would be nice to see exactly what the target is. Moral of the story here – if you are building a game that encourages collecting achievements, make it easy to figure out what it is that needs to be collected. It’s definitely a good idea to show players what the star criteria is right before the round starts – that’s exactly where I’d expect to see it – but it needs to be more easily accessible. A simple solution would be to just add a “cancel” button to back out of starting the round. A better solution would be to allow users to tap directly on a star somewhere to see what it is they are missing. Either way, I want to see exactly what I need to blow up! This entry was posted in Casual, Mobile, review and tagged achievements, Burnout crash, ea, game usability, gui, ios, iPad, iphone, mobile, mobile gaming, usability, ux by mark d. Bookmark the permalink.